for the Automotive and Commercial Vehicle Market. The McNally Oil Catch Can Just Got Better! This new design has many new features greatly improving it over our Gen 1 can. While sticking with an oil catch can design that looks familiar, we’ve added some Bells, Clicks and Whistles we think you’ll find impressive. We’ve finally added quick connect fittings to the top of the can, speeding up the installation process and making it simpler. This was the first thing we wanted to do, so we finally did it! Another feature we added was getting rid of the typical drain valve on the bottom of the can which is hard to reach in most tight modern engine bays. 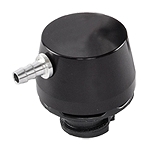 Now we have a release knob on top of the can, just pull it up to relieve the reservoir of the condensed byproduct. This makes maintenance so much easier and it keeps your engine and garage floor neat and tidy. Not only is the release valve on the top but now there’s a level indicator window to let you know when your can is full of contaminants, so no more guessing. Now for the fun stuff. First, Let us start with the check valves. Our old design needed the installer to cut the hose in order to insert in-line check valves and it was crucial that they faced the correct direction. This created a lot of confusion. With the Gen 2 design, our proprietary check valves are built into the catch can, making installation faster and easier. 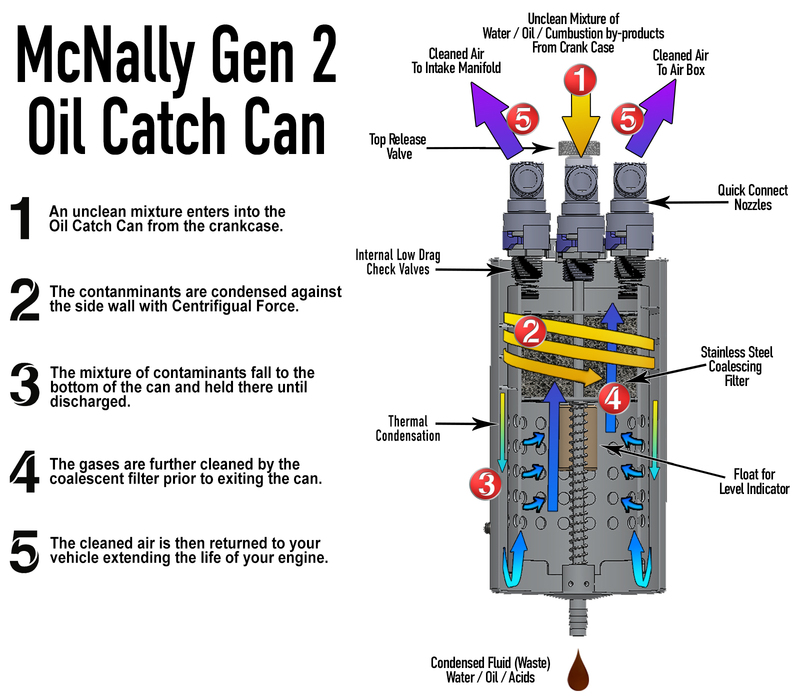 The McNally Gen 2 Oil Catch Can have features which put this can a step ahead of the competition. First, we use coalescent filtration to remove the majority of harmful contaminants that diminish the performance and longevity of your engine over time. Next, the new McNally Gen 2 Oil Catch Can uses thermal differential and centrifugal force in addition to coalescent filtration. As the contaminants enter into the can the proprietary internal design of the cans separation apparatus force them into a spiral motion. Centrifugal force pushes the particles against the now thinner, cooler side walls of the oil catch can and condense faster to collect more blow-by byproduct. At McNally we believe we have come up with the most innovative and efficient design of any oil separating catch can on the market today. The addition of these two features, will give our customers confidence knowing that their McNally Oil Catch Can is doing the job right! and Extend the Life of Your Engine. There is a problem today with Gasoline Direct Injection “GDI” Engines. GDI Engines produce "blow-by" that over time will slowly cause your engine to coke up and loose performance. It will reduce mileage and ultimately damage your intake, valves and pistons in your engine. Installing any of the McNally Performance Oil Catch Cans or Oil Catch Can Kits will reduce this damage caused by Gasoline and Diesel Direct Injection Engine "blow-by". Our McNally Gen 2 Oil Catch Can provides continuous cleaning with every mile and in every driving condition for the life of your vehicle. Everyday vehicle use of a Gasoline Direct Injection (GDI) engine will cause the build-up of a certain amount of oil, sulfur and waste carbon into the intake air system. Because a GDI engine is a closed system this oil, sulfur, and waste carbon, referred to as "Blow-by", naturally finds its way into the air intake system. 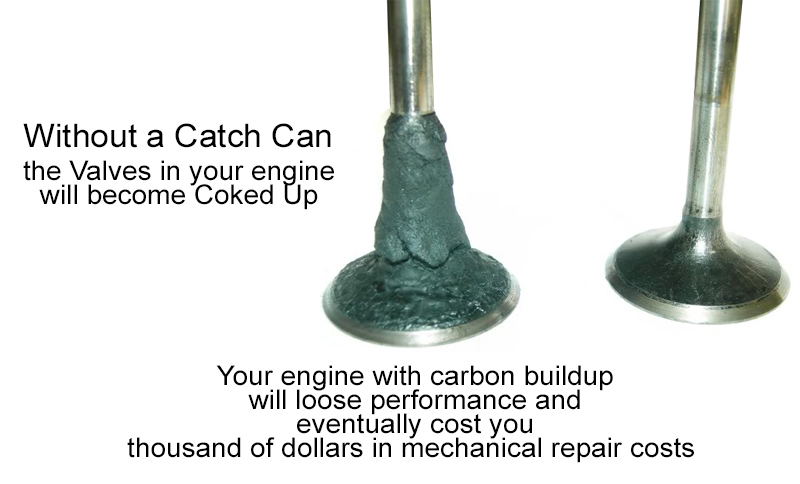 This "Blow-by" results in loss of power, detonation, and long-term burnt carbon buildup on the pistons and valves reducing the air velocity and flow through the engine which keeps the engine running cooler. 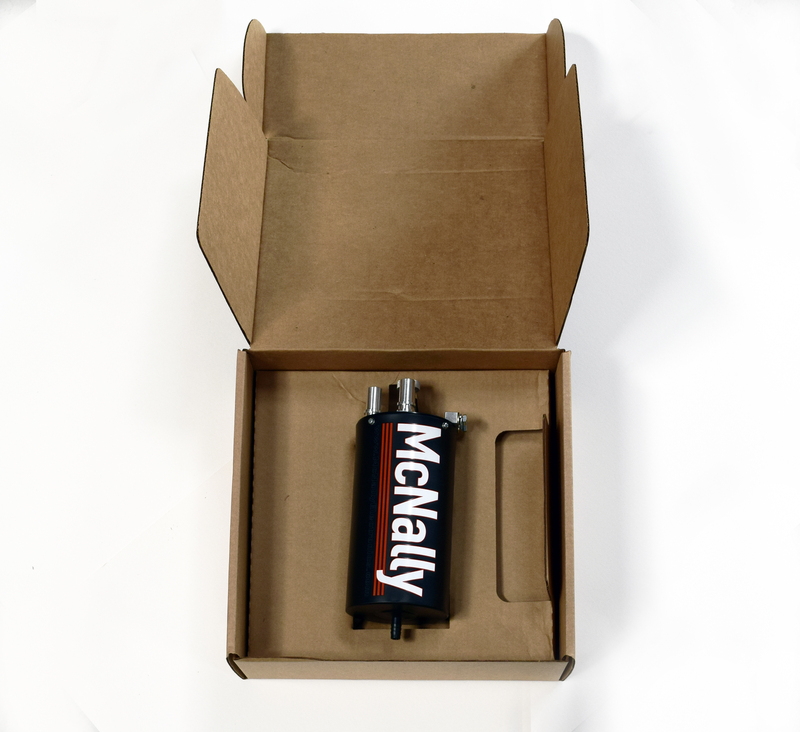 McNally Gen 2 Oil Catch Can is a true oil PCV crankcase evacuation and separation system. 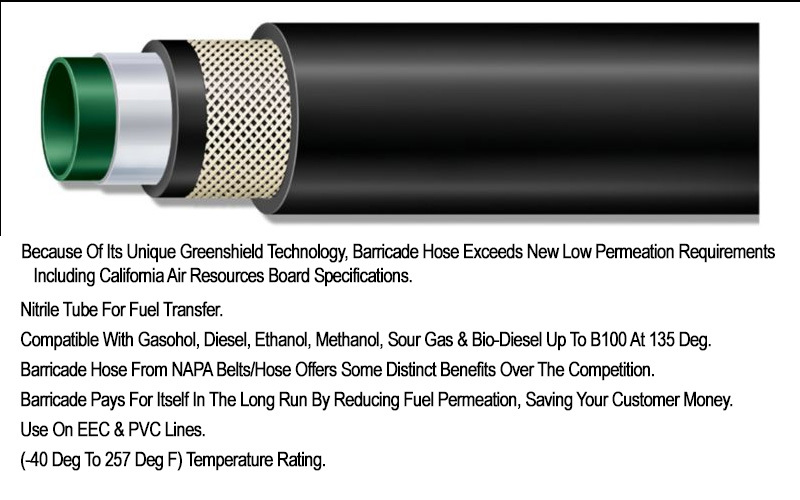 It is engineered to eliminate valve coking issues, increase fuel economy by eliminating oil associated detonation, reduce tailpipe emissions, and prolong engine life by removing damaging combustion by-products and trapping them from entering into the intake air hose connected to your McNally Gen 2 Catch Can. Reduced Catalytic Converter life requiring replacement runs +$2,000 each. The cost from having to do an Intake mechanical cleaning due to carbon build up can run from $1200 to as high as $2,000 and up, EACH TIME. Chemical cleaning is MUCH less expensive however it sometimes can create other problems. If the cleaning is not properly performed by a certified mechanic it is possible for corrosion and even worse may eventually force the purchase of new Catalytic Converter. The McNally Gen 2 Oil Catch Can takes out the problematic particles before they reach your engine. Preventing costly mechanical repairs and engine damage to your vehicle requires additional modifications to your engine. Adding a McNally Gen 2 Oil Catch Can to the closed Original Equipment by Manufacturer (OEM) Positive Crankcase Ventilation (PCV) system is the first step to keeping money in your pocket rather than spending it on auto repair bills. Screen Filtration and Coalescence Filtration. The screen filtration system is just that. You push a liquid (or gas) thru a screen to filter out any unwanted contaminants. When you are dealing with particulates such as "blow-by" that screen will eventually become blocked up. 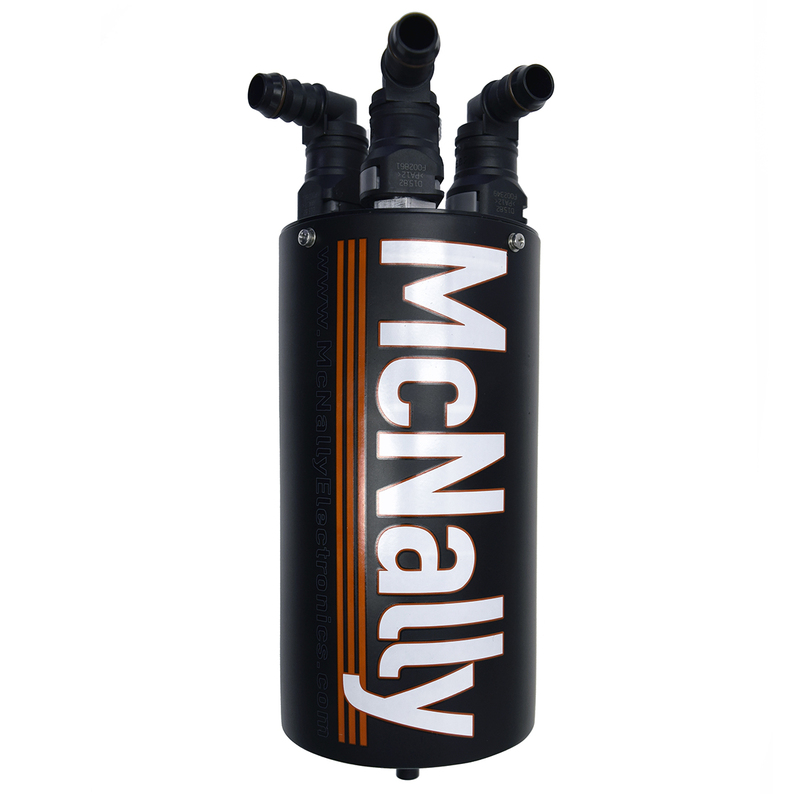 The McNally Gen 2 Oil Catch Can’s stainless steel coalescence filtration system provides an increased amount of surface for the particulates to attach themselves to BEFORE these harmful particulates get to your engine. 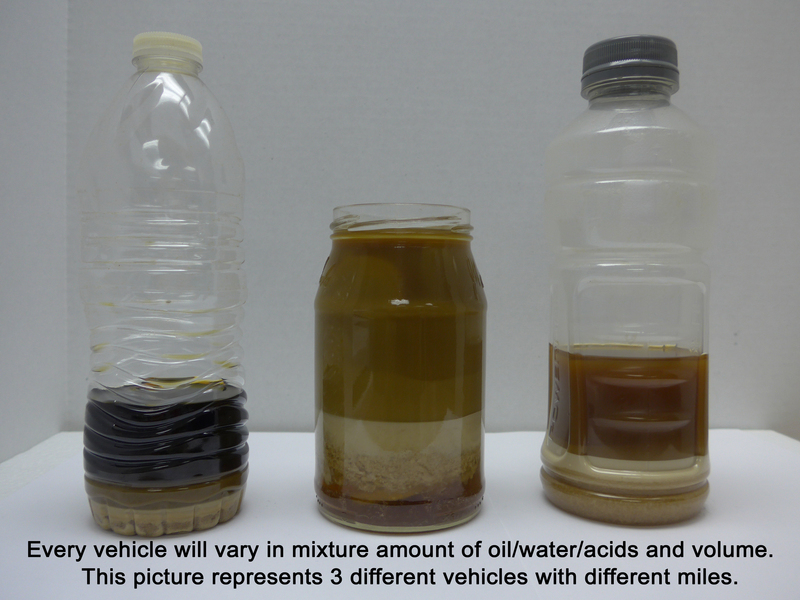 Every engine and vehicle will vary in the amount and mixture of contaminants that are filtered. The best part is the McNally Universal Gen 2 Oil Catch Can is maintenance free. You only have to drain the Oil Catch Can with every oil change. The bottom line is, without a proper evacuation system you WILL sustain long-term and expensive engine damage. This damage begins on a direct injection engine day and mile 1 and progressively gets worse with time. 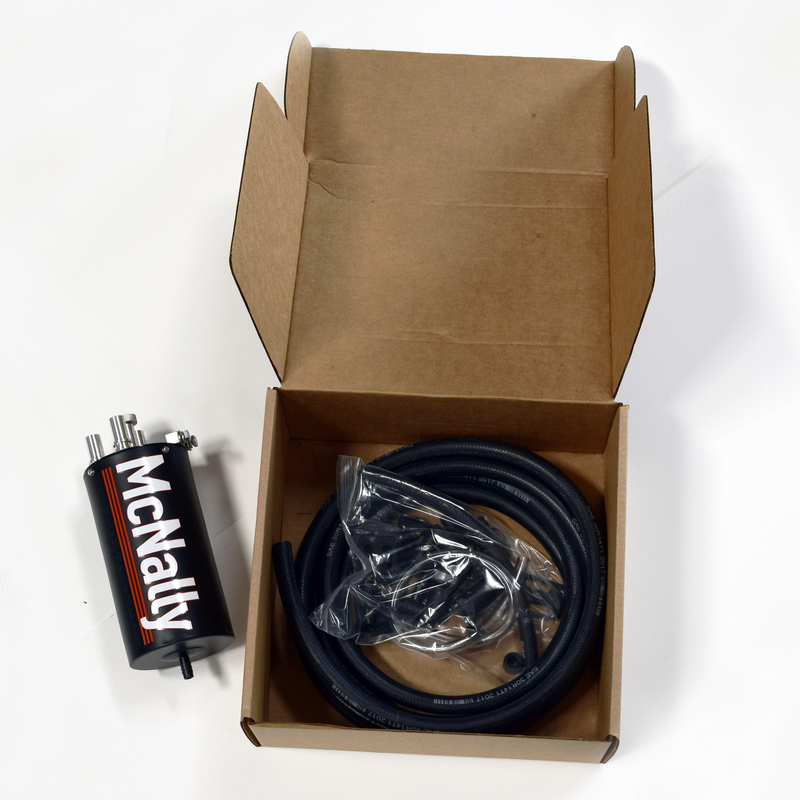 The McNally Electronics Gen 2 Universal Oil Catch Can catches these harmful contaminants BEFORE the damage is done to your vehicle. I purchased my McNally Catch can about year ago, and out off all the research I did, i settled on McNally. Your product surpasses my expectation by a mile. Not only is your product high quality and robust, but your customer service is fantastic. It's amazing what contaminates it's catching and keeping out of my engine. Each day I drive my Ford F150 FX4, I can feel and see results each time I get into the throttle. Thanks for great product developed in USA! Many thanks to your staff and your R&D folks. I have not been able to install yet as I haven’t been around my vehicle for a few months. But working with your staff was an amazing experience and as soon as install I’ll review the product for y’all! If you own a GDI (Gasoline Direct Engine) then you need an Oil Separator Catch Can. What is a Catch Can and why do I need one? 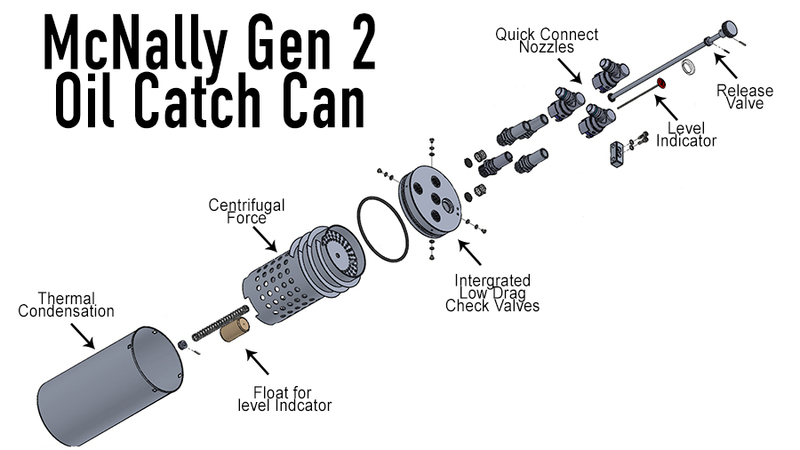 The McNally Gen 2 Oil Catch Can will Save You Thousands of Dollars in Repair Costs and extend the Life of Your direct injection engine. There is a problem today with Gasoline Direct Injection “GDI” Engines. GDI Engines produce "blow-by" that over time will slowly cause your engine to coak up and lose performance, reduce mileage and ultimately damaging your intake valves in your engine. Installing any of the McNally Gen 2 Oil Catch Can Kits will reduce this damage caused by Gasoline and Diesel Direct Injection Engine blow-by. Our gen 2 Oil Catch Can Kits provides continuous cleaning of the intake air with every mile and in every driving condition for the life of your vehicle. * The Catch Can must be drained on a regular basis; it is suggested every 3k to 5K miles. 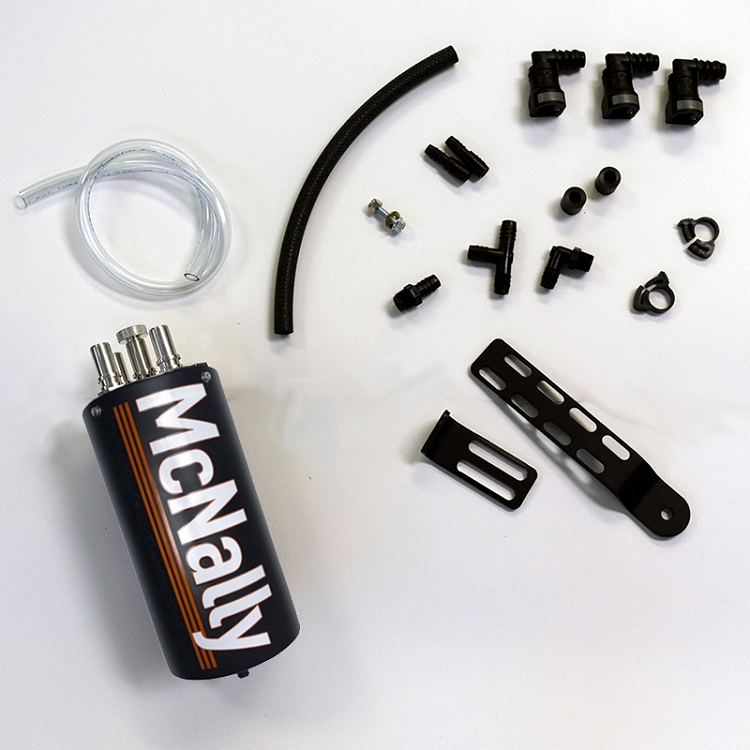 McNally gen 2 Oil Catch Can Kits are a true oil PCV crankcase evacuation and separation system that is engineered to eliminate valve coking issues, increase fuel economy by eliminating oil associated detonation, reduce tail pipe emissions, and prolong engine life by removing damaging combustion by-products and trapping them from ingestion via the intake air charge. Everyday vehicle use of a Gasoline Direct Injection (GDI) engine will cause the ingestion of a certain amount of oil, sulfur and waste carbon, etc. into the intake air system. Because a GDI engine is a closed system, this oil, sulfur, and waste carbon, etc. referred to as Blow-by naturally finds its way into the air intake system. 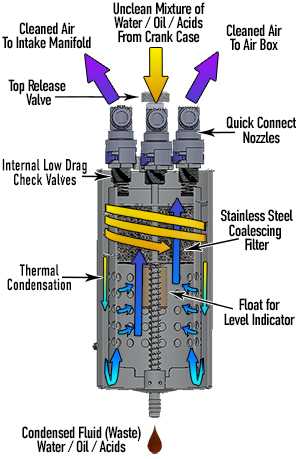 This Blow-by results in loss of power, detonation, and long-term burnt carbon crystal buildup (coaking) on the pistons and valves reducing the air velocity and flow through the engine. McNally Universal Oil Catch Can Kits are a true oil PCV crankcase evacuation and separation system that is engineered to eliminate valve coking issues, maintain fuel economy by eliminating oil associated detonation, reduce tailpipe emissions, and prolong engine life by reducing and removing damaging combustion by-products and trapping them in the catch can and keeping the from ingestion via the intake air charge. And an increase in maintenance costs; intake mechanical cleaning can run from $1200 to as high as $2,000 and up, EACH TIME. Chemical cleaning is MUCH less expensive however it sometimes can create other problems via corrosion and even worse may eventually force the purchase of new Catalytic Converter especially if the cleaning is not properly performed by a certified mechanic. Preventing or mitigating this challenge to your vehicle requires some engineering modifications such as adding a McNally GEN 2 Oil Catch Can to the closed Original Equipment by Manufacturer (OEM) Positive Crankcase Ventilation (PCV) system. The bottom line is, without a proper evacuation system you WILL sustain long-term and expensive engine damage. This damage begins on a direct injection engine day and mile 1 and progressively gets worse. 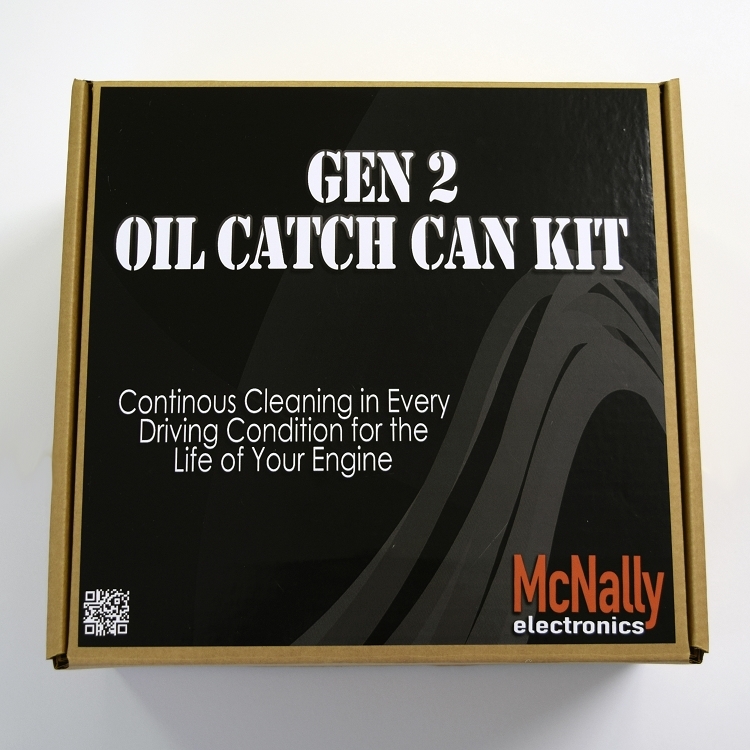 The McNally Gen 2 Universal Oil Catch Can Kits catches these harmful contaminants. The catch can should be drained at every oil change interval in compliance with the vehicle owner's manual maintenance schedule or every 5000 miles which every is sooner. Copyright McNally Electronics Inc. All Rights Reserved.